The government has announced plans to open a 43-mile section of the HS2 high-speed rail link between Birmingham and Crewe in 2027, six years earlier than originally hoped for. Crewe has been chosen above Stoke-on-Trent as the next key staging post on the route to Manchester. Improving transport links with the north of England is a key part of the government's transport policy. The bill for the first stage of HS2 has not yet been through parliament. The bill for the London to Birmingham section of the route, the biggest in parliamentary history, may not gain Royal Assent for a year. Before that can happen, a committee is going through the planned route inch by inch with those affected. The government hopes the London to Birmingham route will be completed by 2026, and the routes to Manchester and Leeds by 2033. A separate bill will be needed for the Manchester and Leeds routes. Last year, the boss of HS2, Sir David Higgins, said the £55.7bn project should be completed sooner than that. The boss of HS2 recommended taking the line a further 43 miles to Crewe last year. He argued that it's relatively straightforward in engineering terms yet would save a significant amount of time. Now the government's agreed, despite a strong bid to go via Stoke instead. Interestingly, today's announcement doesn't include plans for a new hub station at Crewe. That decision won't be taken until next Autumn. New stations are the most expensive things of all, so it raises the prospect of something else losing out. In the past they've looked at whether a planned new station at Manchester Airport should be postponed although the government suggests that's no longer on the cards, "subject to agreeing an appropriate local funding contribution to the costs". HS2 has dropped out of the headlines since the new government pledged support, but there's still a long way to go before MPs even vote on the bill for the first leg, between London and Birmingham. That bill might not get Royal Assent until the end of next year. Still, the project feels a lot more certain than it did a couple of years ago, when the then Shadow chancellor, Ed Balls questioned its value for money. The Chancellor, George Osborne also announced that the former head of the CBI business group John Cridland would chair a new body called Transport for the North, which will look to improve transport links across the North. The new timetable means a part of the second phase of the project is due to open only a year after the first phase from London to Birmingham is due to be operational. "Bringing forward this part of the HS2 route by six years is a massive step in the right direction for the Northern Powerhouse where high-speed rail will play a big role in connecting up the entire region with the rest of the country," the chancellor said. The Treasury said journey times between Crewe and London would be cut by 35 minutes once the new route was open. In his Spending Review last week, Mr Osborne confirmed that the government would spend £13bn on improving transport links in the North. Plans to integrate Leeds' proposed HS2 station with the city's existing railway station have been announced. Dubbed "The Yorkshire Hub", the proposal favours a plans to build on the south bank of the River Aire. A report by HS2 boss Sir David Higgins said the original location in New Lane was "too isolated" and "too detached". Leeds councillor Keith Wakefield said it was "great news" and he hoped the new station would become a "St Pancras in the North". The report considered three options; incorporating HS2 into the existing station, building a new integrated station, or building a new station in New Lane. 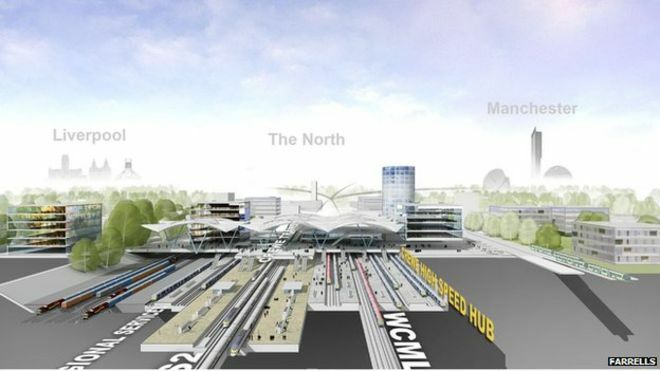 Sir David said the preferred integrated option "connects HS2 and existing rail services through a common concourse, allows for the growth in Northern Powerhouse rail and local services, and provides easy access to the city centre and motorway network, whilst creating the potential for a landmark architectural statement". In a letter, regional civic and business leaders said: "The proposed Leeds hub station, integrating HS2, Northern Powerhouse rail and improved local and regional rail services, will transform the economy of Leeds and the city region. "We now need to make this a reality and create a transport hub the nation can be proud of." Mr Wakefield, the transport committee chairman for West Yorkshire Combined Authority, said: "This is great news for Leeds. Our aspiration should be St Pancras in the North." The recommendation will now be considered by the chancellor. A final decision on the route between Birmingham and Leeds is due to be made in autumn 2016. The proposed high-speed rail link was originally due to stretch from London to Birmingham by 2026, and then reach Manchester and Leeds by 2033. But Sir David proposed speeding up the £50 billion project last year.